Welcome to the Balanced keyboard website! 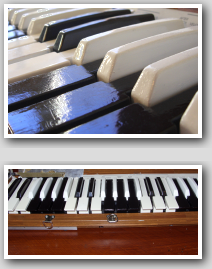 The Balanced keyboard is the alternative musical keyboard which re-arranges the irregular physical layout of the standard keyboard into a completely regular and consistent, or 'Balanced', layout (see the pictures on this page). The regular layout of the Balanced keyboard means that, unlike the standard keyboard, the physical shapes of chords, scales, intervals and so forth are consistent right across the keyboard, and in all musical keys. The consistent layout of the Balanced keyboard means that it is much easier to learn, figure out and play musical structure than on the standard keyboard. With a little practice on a Balanced keyboard, you should be able to move competently through a basic reportoire of chords, scales and melodies in every key. The Balanced keyboard is currently not a commercially-available product you can buy in your local music store. However, you can build one over a weekend by modifying a standard electronic keyboard, an operation which requires only a basic level of DIY skill - see the Build One section. This website provides a range of information and instruction to support the building and learning of the Balanced keyboard. I came up with the idea of the Balanced keyboard in 2003, as a spinoff idea from other projects which I'd been working on. However, it turns out that the idea has existed in various forms since around 1650 - see the People and resources section of this website. The Balanced keyboard layout also goes by various other names, the main one being the "Six-Six" or "6-6" keyboard, because each octave has 6 keys in the bottom row and 6 in the top row, compared to the standard keyboard's "7-5" layout. The Balanced/Six-Six keyboard is an example of an "isomorphic" keyboard, meaning that any musical structure has the same shape on the keyboard wherever it occurs. I hope you find the Balanced keyboard to be a useful alternative to the standard keyboard - happy playing! An E-mu Xboard 61 converted to a Balanced keyboard. Copyright (c) Bart Willemse 2003 - 2018. All rights reserved.